Now that we have a couple of lower-end products out for the 16/17 hockey season, it's time for something a bit more premium. Artifacts has been a collector favorite for years because of the hits that collectors can find in the product. It used to be that each box had memorabilia AND autographs in it, but since last year, there is no guarantee of an autograph. Let's see what this hobby box of Artifacts holds. 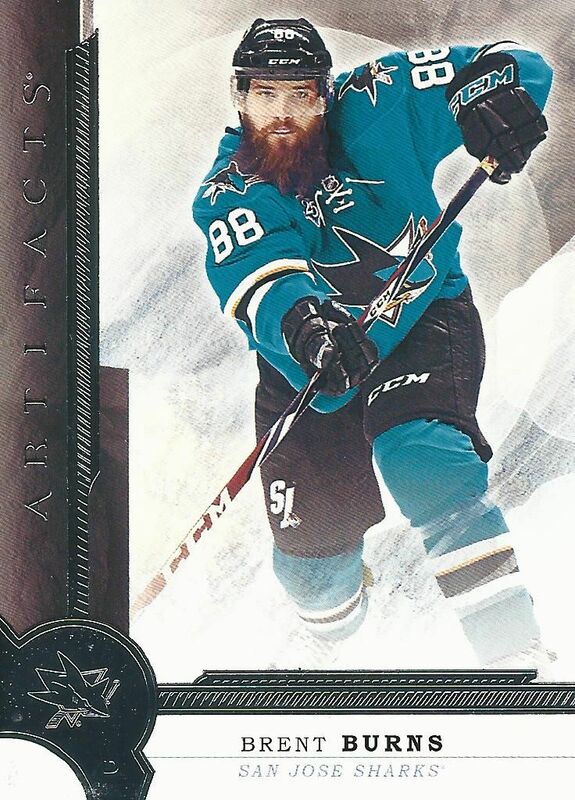 Upon first glance, the Artifacts cards remind me of the super-premium Premier cards that came out not too long ago. The look is definitely similar... and that's a good thing. Many collectors enjoyed the look of Premier so I'm sure they'll like these. Actually, Artifacts has always done a really great job with the base cards. They've always been a step up in terms of card quality and design. The foil is generous and the overall look is clean. I particularly like that the base cards has modern tones and graphical choices. Upper Deck has a very nice looking base card here. The back of the base cards are appropriately designed so that they match well with the fronts. I love the borders and backgrounds used here. The backs are colorful with a useful amount of stats as well as a nice written piece about the player. I really can't find much to fault here. The back of the Artifacts base are very well done! 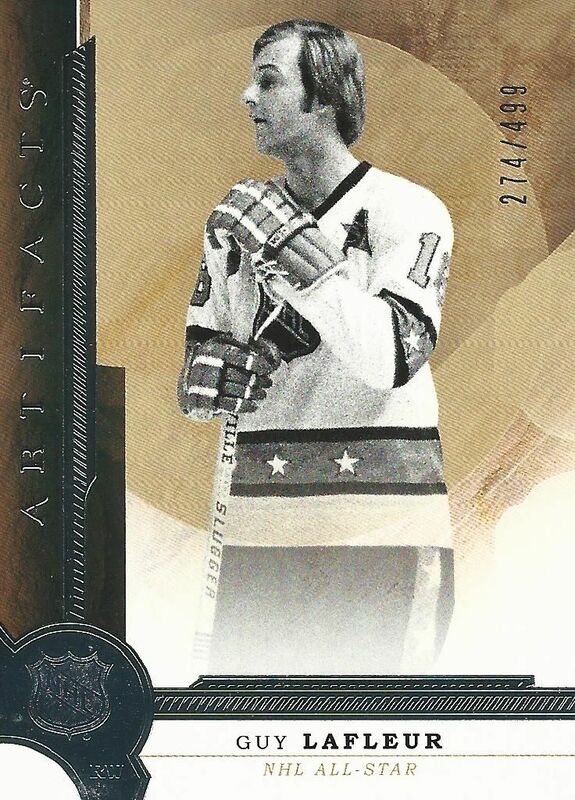 Legends of the NHL get special treatment in Artifacts with limited serial numbering on their cards. Each legend card is numbered to just 499 and has a similar design to the standard base save for a golden background. The legend cards are tastefully done. I've got to give props to Upper Deck for making this particular set look very classy. 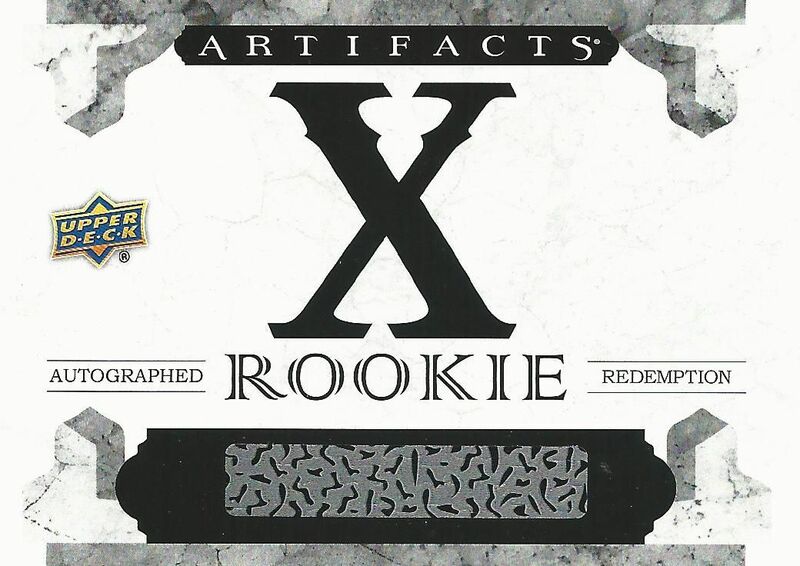 The standard rookie cards out of Artifacts have a similar look and feel to that of Artifacts rookie cards from the past. The rookie cards have a bright white look to them with the rookie between two pillars of foil. Unfortunately, most of the rookies found in this set will not be the highly sought out ones from this season. Those guys are found in the form of a redemption card. Each 8-pack hobby box of Artifacts guarantees collectors three autograph, memorabilia, or aurum cards. It's important to note that there is not a guarantee of anything in particular, but we all know that three autographs are not coming out of a box of Artifacts. The aurum cards are new. I've seem them and they look very nice with their all-gold sheen. Sadly, I didn't get one of those in this particular box. Parallel cards are prevalent in all Upper Deck products, but Artifacts seems to be on of the most heavily paralleled brands. 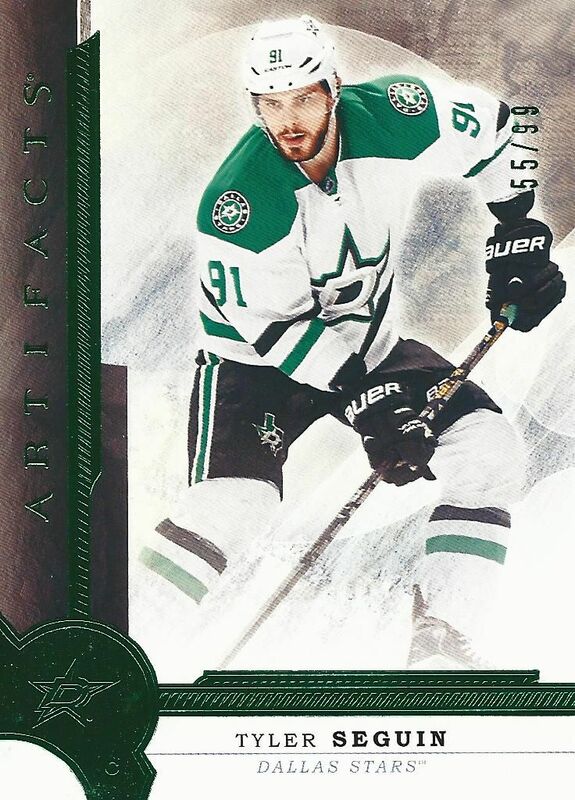 The base cards, like the Tyler Seguin card shown above, have multiple colored standard parallels... but so do the memorabilia versions of them as well. Each step higher in the parallel tier has more exciting memorabilia or autograph and lower serial numbering. Going for a full rainbow can be done, but it is extremely difficult and costly. But don't let that stop you from going for one! Like I mentioned, base cards have memorabilia parallels. The dual jersey cards have to be the most basic of those types of cards. Artifacts has been churning cards that look like this for years now, so the dual window design is familiar with seasoned collectors. 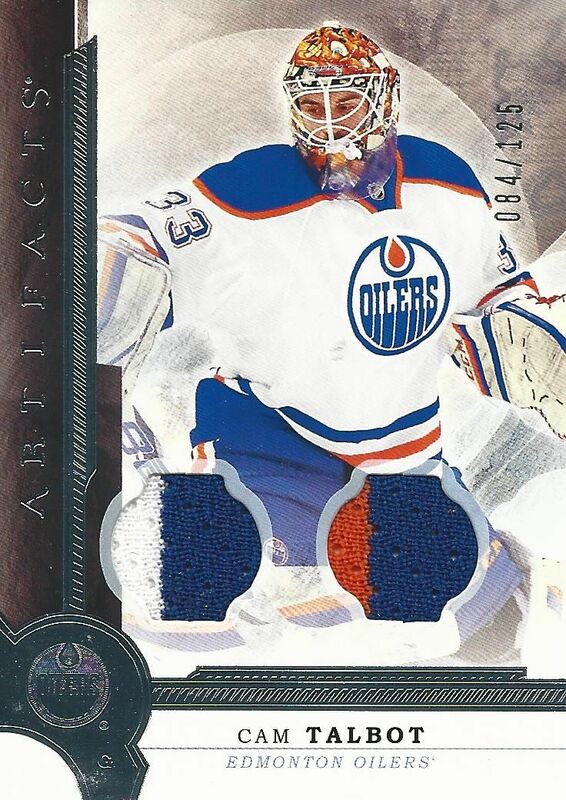 The Cam Talbot dual jersey card I pulled was nice because the jersey pieces were actually different colors. This card is numbered to 125. 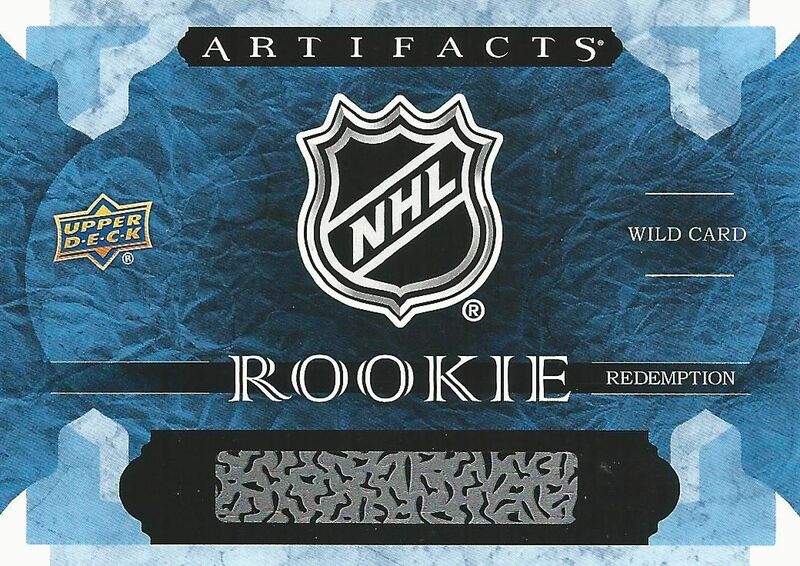 A staple of Artifacts has to be the rookie redemption card. 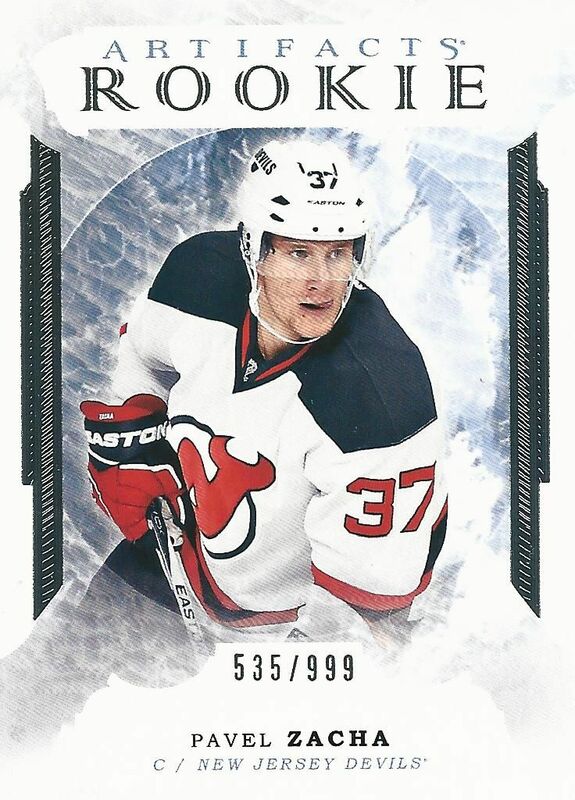 The folks over at Upper Deck know that Artifacts releases earlier than the regular NHL season so it can't get the popular rookies in the set. Well, they can with the use of these rookie redemption cards. Each team will have a redemption card that you can redeem for a new rookie that hadn't skated yet at the time of Artifact's release. Wild card redemptions, like the one I got, don't specify a team so the player is a real mystery. Luckily for me, I pulled an autograph (of sorts) out of this box. It came in the form of a rookie redemption card. There are a number of these cards and I'll have to wait for Upper Deck to release the checklist at a later time in order for me to know who I got. This is the first of of these autographed rookie redemptions that I have gotten, so I'm pretty happy with it. I really wonder who it will be! One box of Artifacts will not even scratch the surface of what the product has to offer collectors in terms of hits. But if you have been familiar with Artifacts in the past, you'll know what the brand puts out - and this year is really not that different than of other years. I've always enjoyed breaking Artifacts, and I still do. Upper Deck is giving us a tried and true product that has some very good hit potential at a decent price. I was able to get my 8-pack hobby box for well under $100. That being said, there is a little less excitement with Artifacts because autographs are now no longer guaranteed per box. I've always said that ink is better than cloth, and when I buy anything, I'm always hoping for autographs. This year I was fortunate enough to the the autograph redemption card, but last year I remember not getting an autograph and being unhappy about that. This year's Artifacts set looks great and is a fun break. For its price, I'd definitely recommend that collectors get a box or two and open up some packs. There really is a lot to find in the product. I know for sure that I'll be chasing down cards that I want. Hopefully, lots of collectors will be breaking Artifacts this year so that we can trade or buy and sell easily on eBay. I'll be looking for some of my favorite Sharks autograph and memorabilia cards this season! I really like the look of them..great review as always! The base cards look nice. Hopefully the redemption cards you got are good ones! Really sweet looking cards! Love the base design, the colours look really nice as well! Nice rookie redemption autograph! great review as always!! Enjoyed the review p.s what are the rookie redemption of? Great review and love the look of artifacts!! Nice base! I cant wait for your two redemptions to come in your mailbox blacksheep. I really like the look of all the cards, especially that emerald parallel of Tyler, the green goes great with the Stars jersey. Great review would love to see what both of the Rookie Redemptions turn out to be! Great review as always! The base design is nice again but it seems like it'll be difficult to get value in the inserts unless you luck out. And you pay close to $100 for 8 packs of 4 cards? Trying to build the set will be costly. Hope you get a nice rookie auto! Thanks for sharing your newest break, Luke! Nice hits overall and the icing on the cake was the "X" autograph redemption. Hopefully, it's a good one! As always, appreciate the opportunity to win a card from your break! Great review nice watching you open new products kee up the good vids!! + Artifacts is always one of the best looking products each year! + As always, there are great cards to be pulled. - I miss the guaranteed autographs. - They maybe could've added an physocal insert card when you pull a redemption. Otherwise you will only have six non-base cards the next few months. I'm a little disappointed that the guaranteed hits is going down, not up after the McDavid year, but guess I'll still buy a bit... always enjoyed the parallels and design. Love watching your breaks! Like the look of the base but you can only seem to win with this product from a hobby box. hopefully your X rookie is a good one. I really like the look of the base cards this year! Artifacts is still a good product as always. Love Artifacts!Beautiful cards and the price is really good. I agree the base look very nice, and I am hoping to pull those Aurum cards. 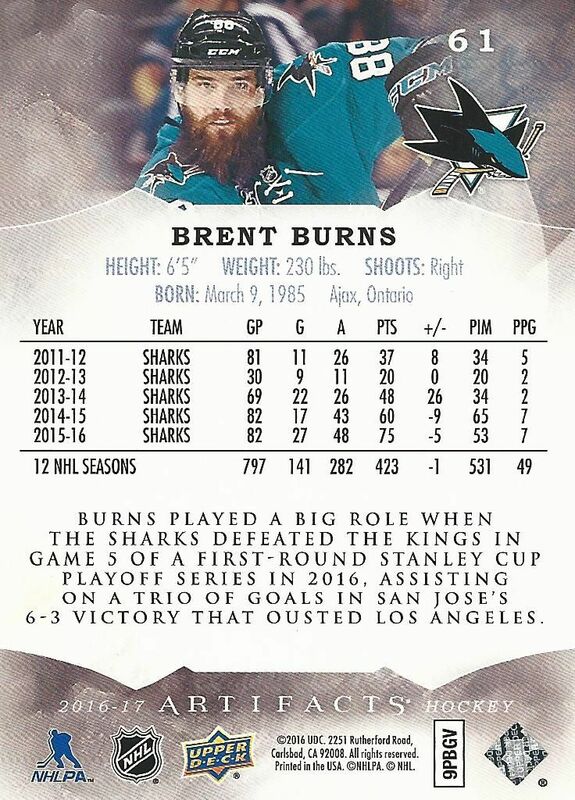 I just do not like how they did not include any Sharks rookies except in the redemptions. For that reason I will stick to singles, and maybe buy a blaster since I am saving up for a hobby box of 16/17 Series 1.
nice review and break i am looking forwad to seies one hey btw who is the key rookie this year i collect 1strd draftpicks and the website that i buy my products from has no info yet. Nice review nice looking cards. Nice base, the hits could have been better, but a nice break overall! Wish they didn't have to have redemptions, but this is a classy product at a more affordable price. Great review! Hey, nice vid and hits blacksheep! I'm probably going to get a box of artifacts as well... Keep up the great work bro! I like the cards at the hobby level but the retail is a little lacking.